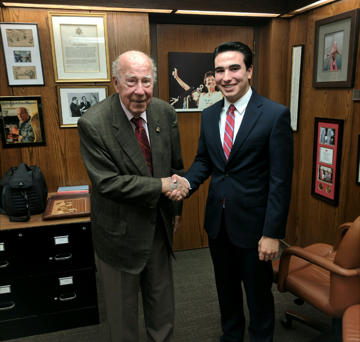 On August 13, 2018 I had the great honor to interview former Secretary of State George P. Shultz. 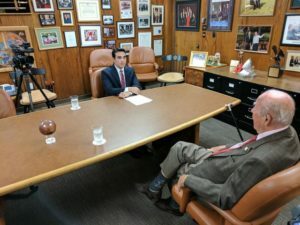 I had been part of a previous Mount Madonna School Values in World Thought interview with Shultz, and then recently I had the idea to request a one-on-one interview with him. I was reading a great book, The Greatest Generation by Tom Brokaw. In the book he shares the stories he accumulated from his interviews with WWII veterans, and explains the significance of this very special generation. There was something that Tom Brokaw said in his book that instantly caught my attention. 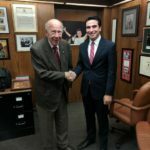 He said, “I realized that they had been all around me as I was growing up and that I had failed to appreciate what they had been through and what they had accomplished.” I read that part over, and over again (and thought of the remarkable man I had met before, George Shultz). It was then, that I decided to request this interview, and did so that same day. Within a couple of days, the interview was arranged and confirmed. I was full of excitement, and it was the only thing on my mind for the three weeks leading up to the interview. George P. Shultz is one of two people in United States history to have held four federal cabinet positions: serving under the Nixon administration as Secretary of Labor, Secretary of the Treasury, and Director of the Office of Management and Budget, then as President Reagan’s Secretary of State. Shultz has always had a quick and admirable response to duty, starting from his early adulthood. He saw the effects of the Great Depression in the 1930’s as a young teenager, and because of this decided to study economics, to find the answers. His knowledge of economics was recognized, when he became an economic adviser for President Eisenhower in the 1950’s. On December 7, 1941, the Japanese military attacked Pearl Harbor, changing the course of U.S. history, and along with it, Shultz’s plans. Shultz enlisted in the Marine Corps, and served in combat in the Pacific. During my Interview with him, he said, “I remembered the heroic Marines on Guadalcanal. They were very inspiring, so I said that’s my outfit. So I joined the Marines. I went from college into boot camp. ”When you serve, particularly when you serve in a war, combat, you are serving your country,” he continued. “It becomes part of your life.” Then Shultz said something familiar, something I have heard many veterans of WWII say, “It’s sort of obvious that it’s the thing you should do.” That, to me, is a stunning statement. It is obvious that when your country is under attack, that you as a young citizen defend it. It is your duty. Simple as that. No questions. That is something that I find to be truly admirable about his generation. During the interview, Shultz frequently mentioned a phrase in that he acquired during WWII and carried throughout his service as Secretary of State, he calls it “boot-camp wisdom.” He said, “I remember my sergeant handed me my rifle and he said, ‘Take good care of this rifle, this is your best friend. And remember one other thing, never point this rifle at anybody unless you’re willing to pull the trigger.’ No empty threats. Boot-camp wisdom.” He continued, “I told that story to President Reagan, and we were very careful in what we would say. Because we wanted to have the reputation that what we said, we meant, so you better pay attention to it. If you make an empty threat, nobody pays attention to you anymore…And boot-camp wisdom had another side to it too, because you learn to be somebody who does what you say you’re gonna do…so it teaches you that trust is the coin of the realm. Without trust, you don’t get anywhere.” There I was, sitting across from him and all I could think was how could this much wisdom be expressed in just a few sentences? It seems so simple, yet so many people in power lack this knowledge. Nikita Khrushchev has told his people what our answer will be. He has told them that we are retreating under the pressure of the Cold War, and someday when the time comes to deliver our ultimatum, our surrender will be voluntary because by that time we will have been weakened from within spiritually, morally, and economically. 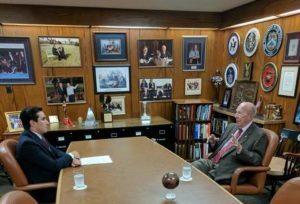 Grasping a “sense of purpose” was a priority for George Shultz and President Reagan. And in my opinion, I believe that the Reagan administration did a great job of recapturing the nation’s sense of purpose, especially after experiencing the 1970s, with high inflation, government scandals, the Vietnam War, the Iran hostage crisis, and the pressures of the Cold War. I believe President Reagan left office in 1990 with a much more prosperous and prouder country, and George Shultz played a big role in that. I hope we can achieve this again, sometime in the near future. We are currently a very broken country. 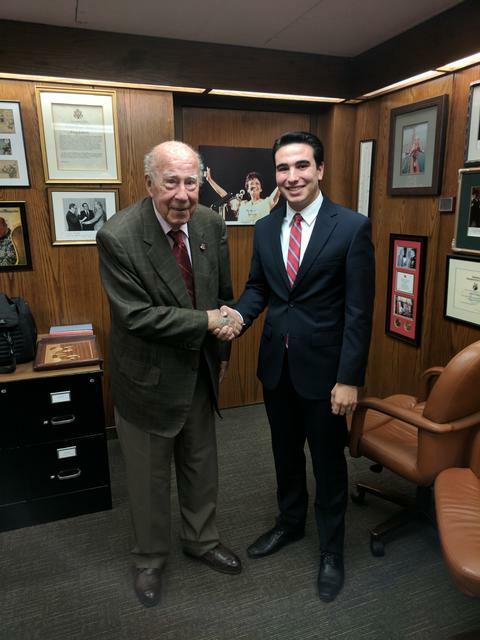 George Shultz is the best example that we have today of our country’s values, and the Greatest Generation. We as a country owe a great debt of gratitude to people like Secretary Shultz. They have given so much for our country, and played a crucial role in preserving our freedom. This is why I appreciate our veterans so highly, because they are truly willing to sacrifice everything for the country’s values that they believe in so much. They risk their chances of being husbands or wives, fathers or mothers, grandfathers or grandmothers. They risk it all for the betterment of our nation’s people and our freedoms. This interview was influenced by my appreciation for the Greatest Generation, and if there are any young adults who may be reading this right now, I want you to truly imagine the following scenario. You were brought up in the Great Depression, a decade full of poverty, and by the time you were an adult with the opportunity to go to school, your country was attacked. You had two nations trying to destroy freedom around the world. Your family and country was at risk. Now, you know you have to go to war. You join the military instead of school, and you frequently hear news of another young man from your neighborhood who has lost his life for his country, and who would only return home draped with an American flag. Now, after a few years, the war has ended, and you return home. As you grow older, you see the freedoms and prosperous lifestyles that are now available because they were fought and bled for by you and many others, and were fought for with two primary things in mind; family and country. You see happy families and kids who only exist because they were fought for, with you included. Now, imagine people disrespecting that. Imagine while you’re at the end of your life, there’s a generation that doesn’t care, and a nation that has forgotten. Today, most of us only see our way of life, we don’t see what had to be done to achieve it, and because of that, we often don’t appreciate it. If nothing in life is worth dying for, when did this begin – just in the face of this enemy? … Should the patriots at Concord Bridge have thrown down their guns and refused to fire the shot heard ‘round the world?’ The martyrs of history were not fools, and our honored dead who gave their lives to stop the advancement of the Nazis did not die in vain. This is why it is important to remember and honor people like Secretary Shultz. I very much appreciate George Shultz taking the time to allow me this interview with him. It is a memory I will cherish for the rest of my life. On November 9, 2018 at 9:00am, Mount Madonna School will host The Cost of Freedom, panel discussion with U.S. veterans through the lens of the WWII-era to present day, arranged and moderated by Kamkar. The event is free and open to the public.